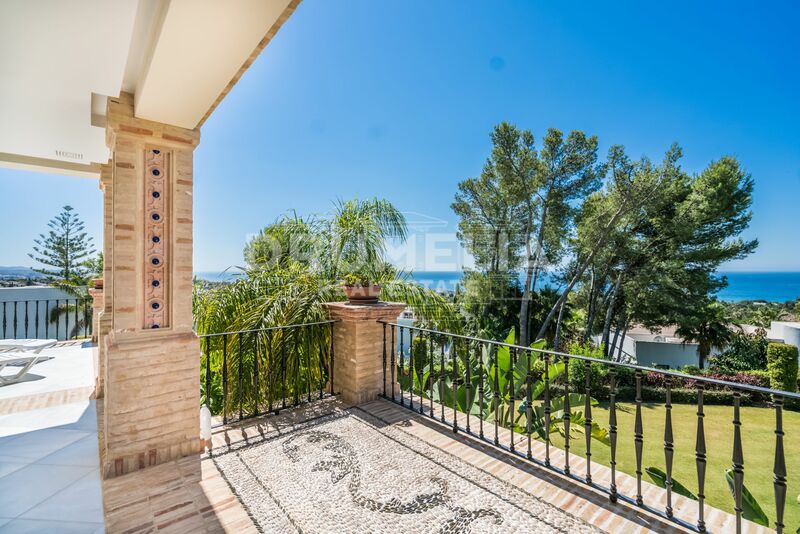 If you are looking for the top of the top do not miss this magnificent property with a very individual style. 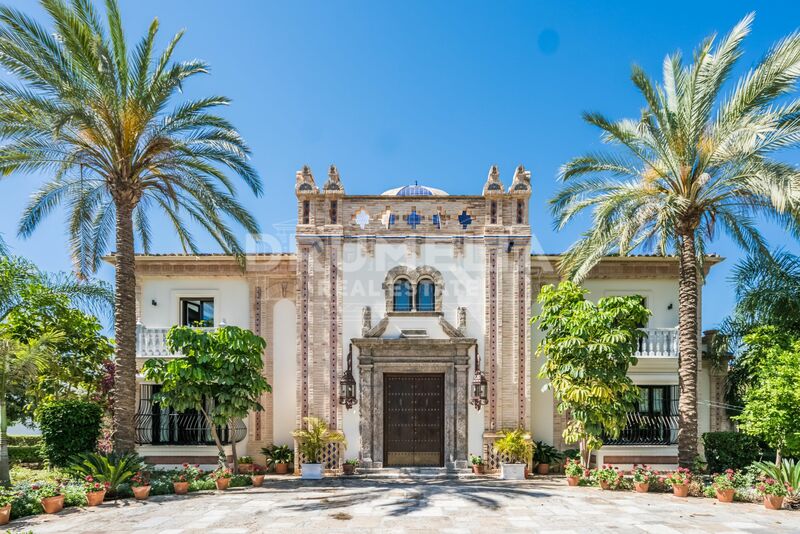 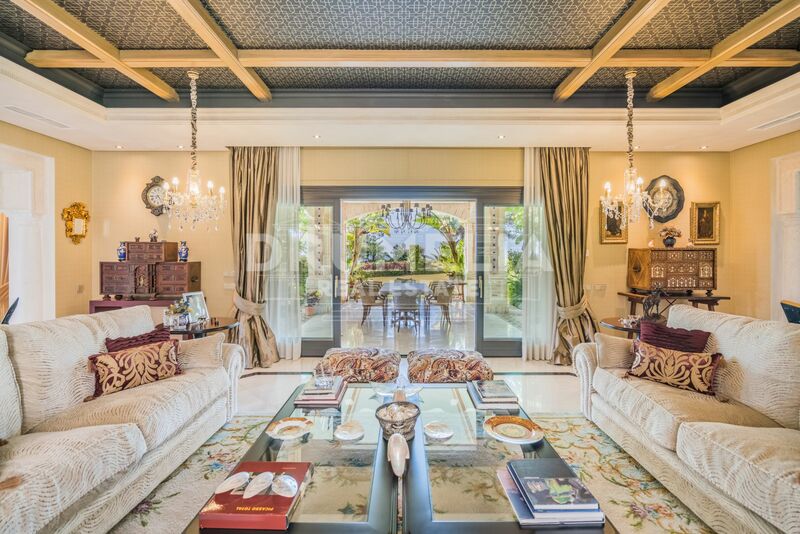 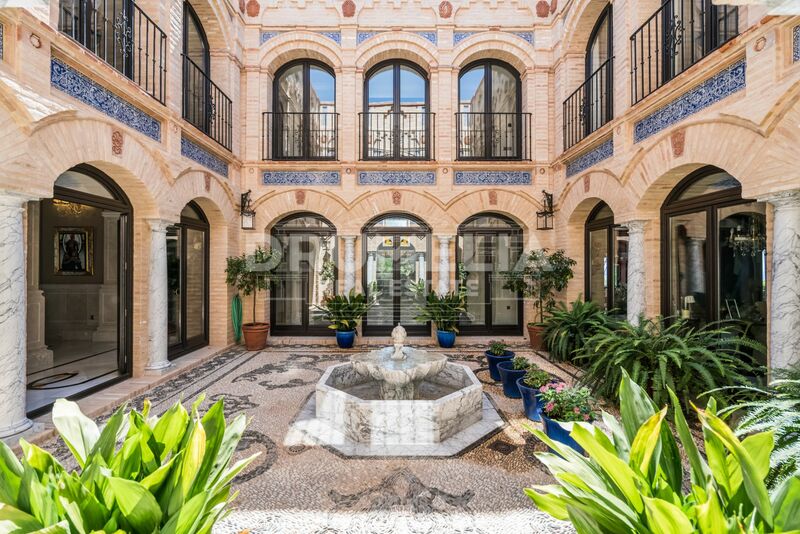 Prepare to be amazed by the unique palatial villa created in 2012 in Andalusian style influenced by rich heritage of exotic Moroccan and Arabic architectural traditions. 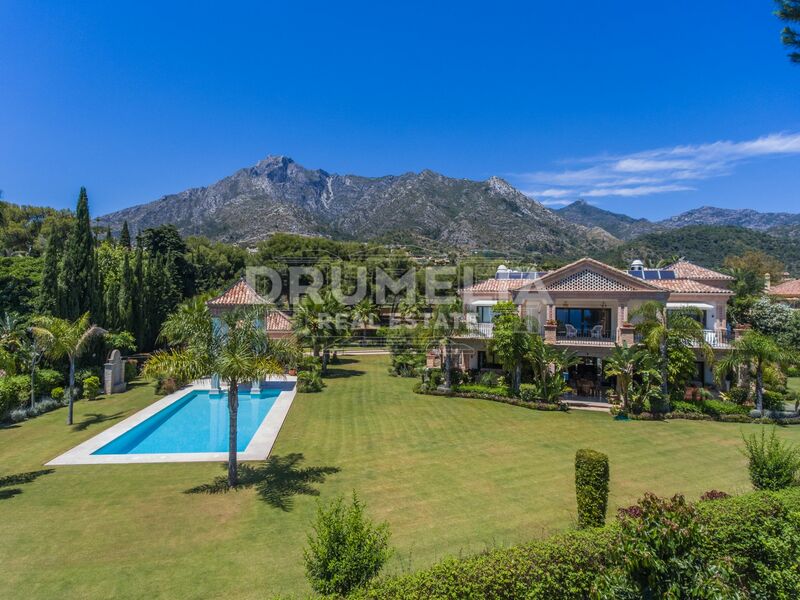 No expense has been spared in creating what is truly one of the most spectacular properties in the area. 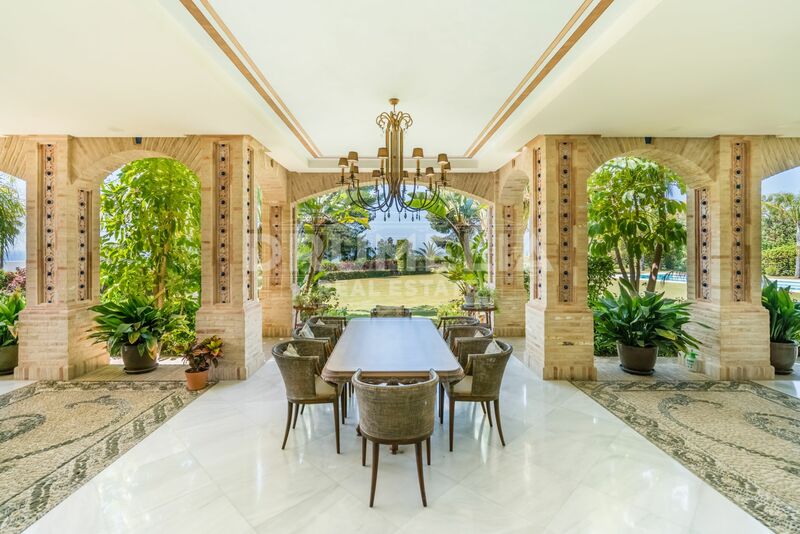 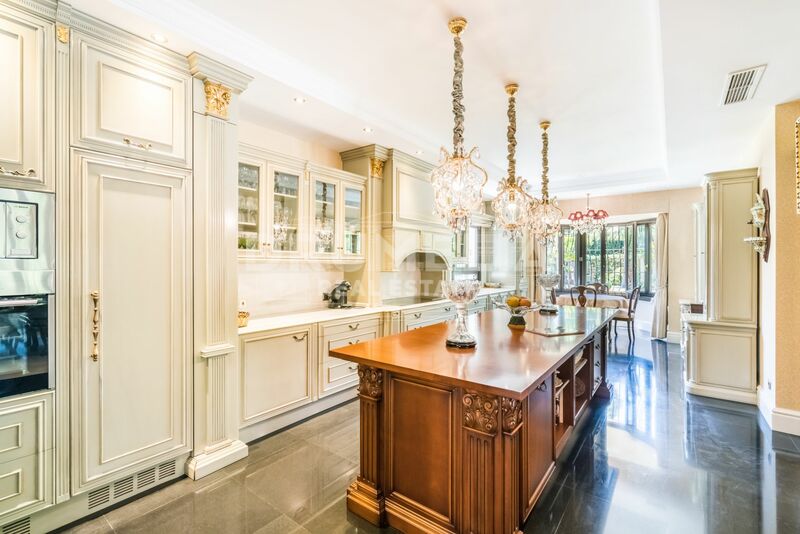 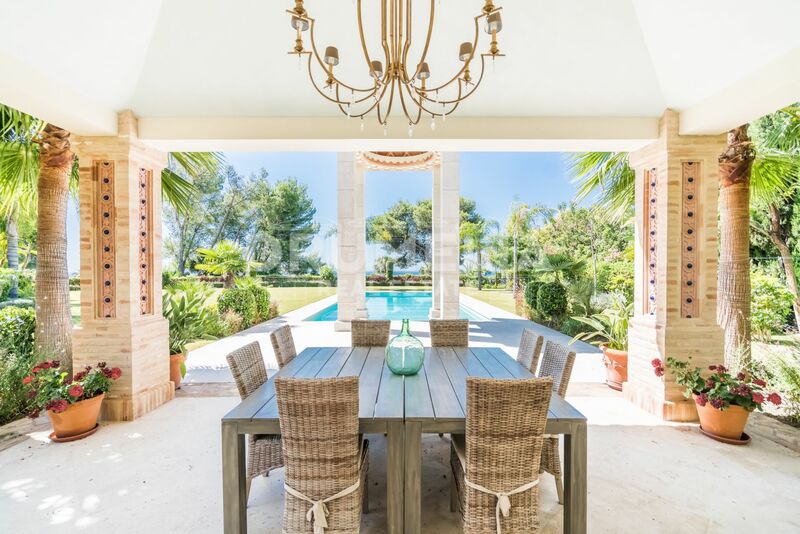 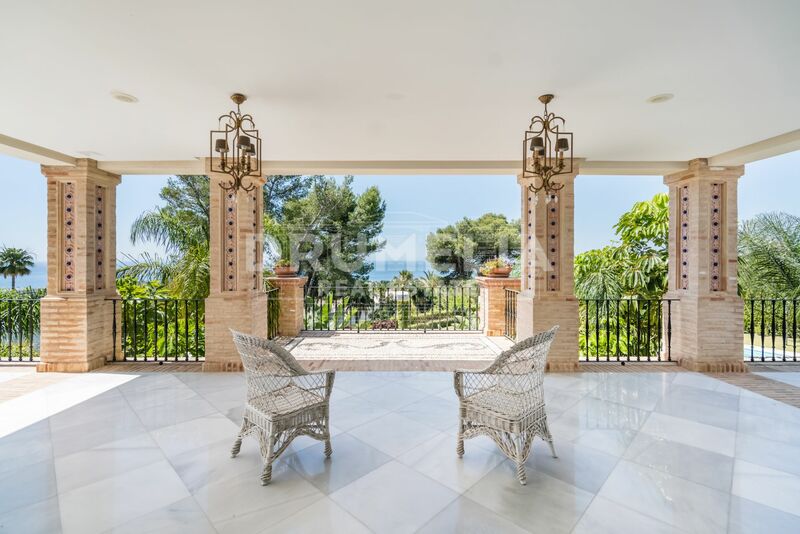 Bright and immaculate, it has been built to great detail by a renown Spanish architect using state-of-the-art craftsmanship and only the most precious materials, incl. 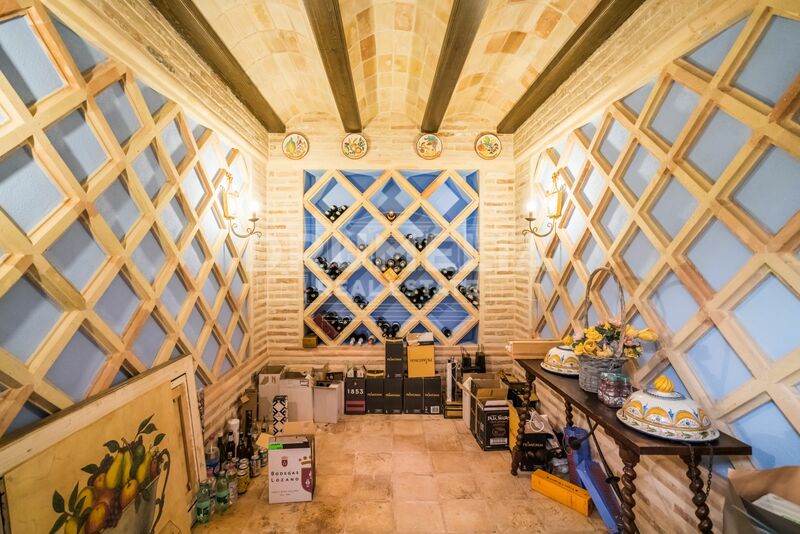 original pieces of marble and arches from monasteries and churches dating back to the 17th and 18th century. 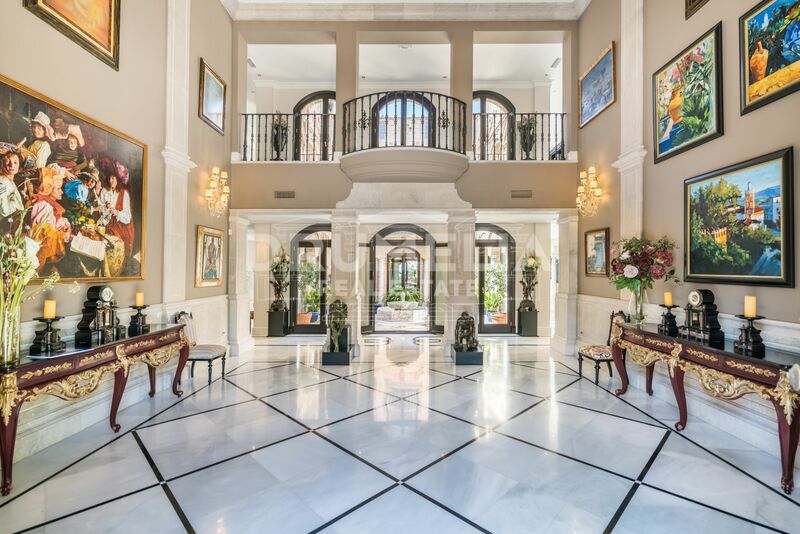 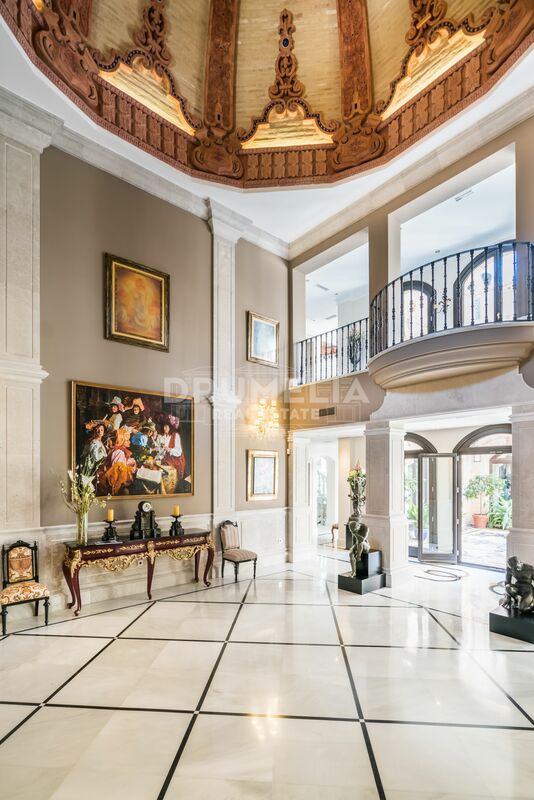 A huge artisan archway of 5m height leading on to a driveway surfaced with old marble pieces dating back to the Roman Empire, an imposing entrance hall with a height of 7m topped by an enormous cupola, extensive courtyard with marble fountain, patios and terraces, authentic wine cellar, handcrafted woodwork, fine art marble floors, accents within niches, mosaics, traditional patterns of hand painted decorative glazed tiles are exquisite features which give the house a marked Al-Andalusian flavour. 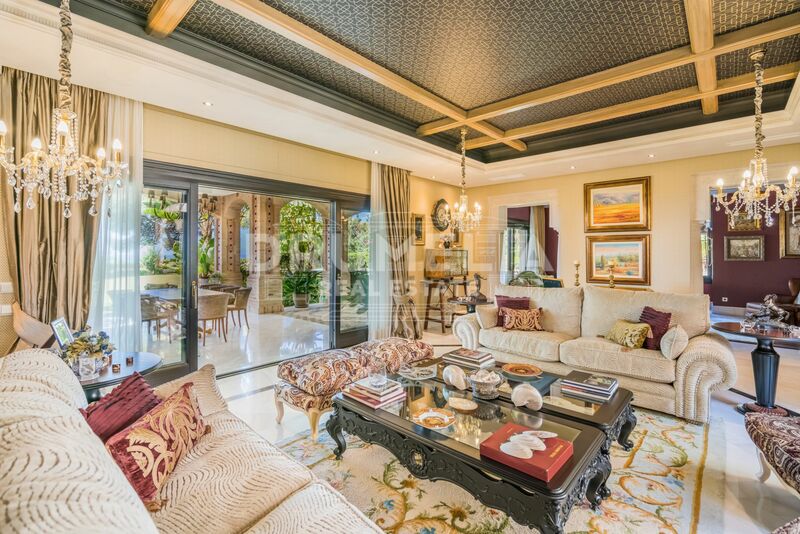 The grand property offers: the welcoming hall, fully equipped Clive Christian kitchen with granite tops, breakfast area and centre island, living room, lounge and dining room all leading to spacious covered porches (south-facing is overlooking the sea while west-facing is perfect for enjoying incredible, world-famous Mediterranean sunsets). 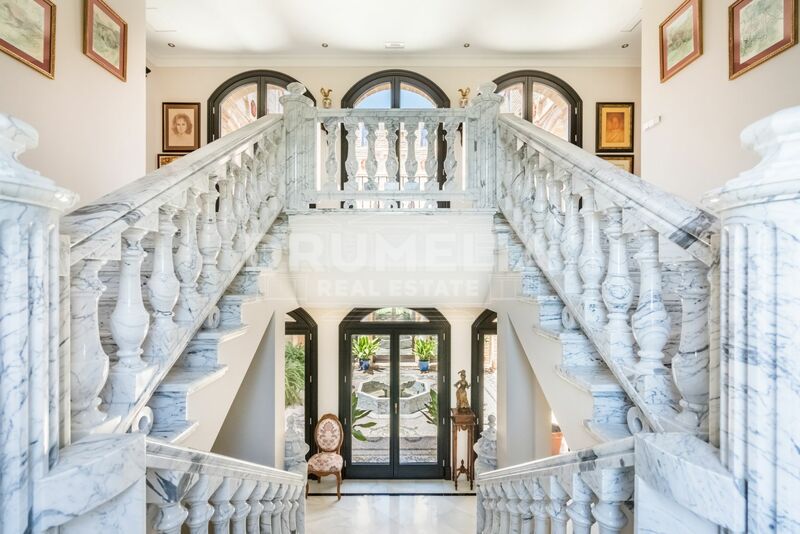 The upper floor features 4 bedroom suites with individual terraces and dressing rooms and is accessed by a sweeping double, grey marble staircase which is topped by a cupola of brick laid artisan craftsmanship in Moroccan design. 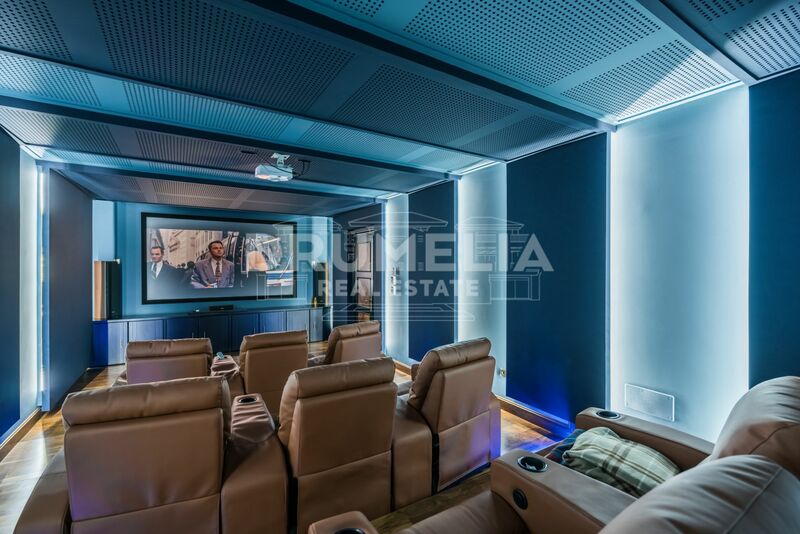 The basement is distributed into a garage for 5 cars, separate guests or staff apartment with 2 bedrooms, cinema room equipped according to latest technical standards, sauna and technical room with a heating system sourced efficiently by bio energy pallets. 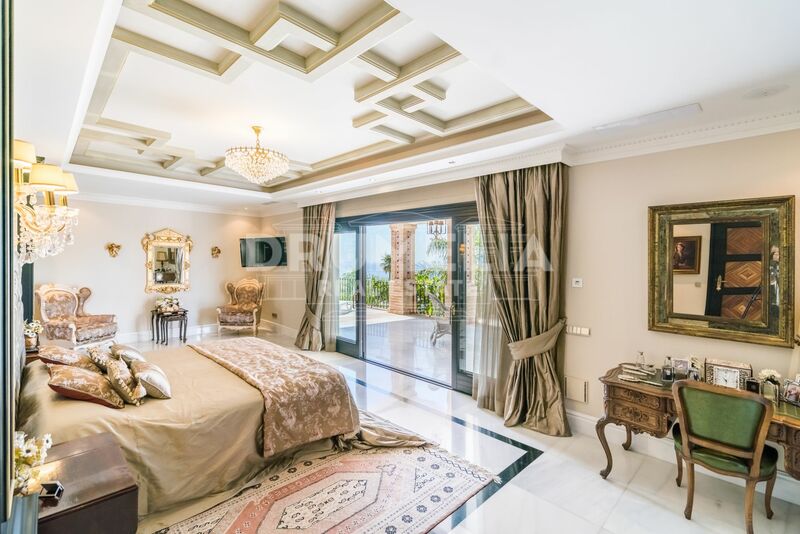 It benefits from a lift connecting all floors, hot and cold central A/C, marble and wooden floors and underfloor heating throughout, fireplace, Jacuzzi, piped music system, safety glazing, electric shutters with central locking, security system, etc. 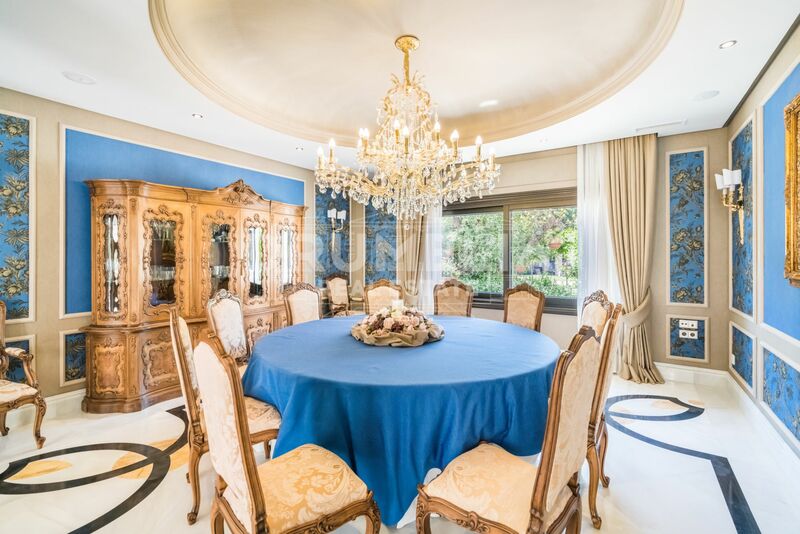 Everything is high quality when it comes to furnishings and décor too: eye-catching furniture pieces, luxurious textiles, precious carpets, stylish almost decadent elements, like black columns and gilded surfaces, immense but elegant chandeliers, fine handmade blown crystal glass, mouldings and multi-layered ceiling treatments with their own lighting schemes… You children will grow up surrounded by beautiful royal interiors! 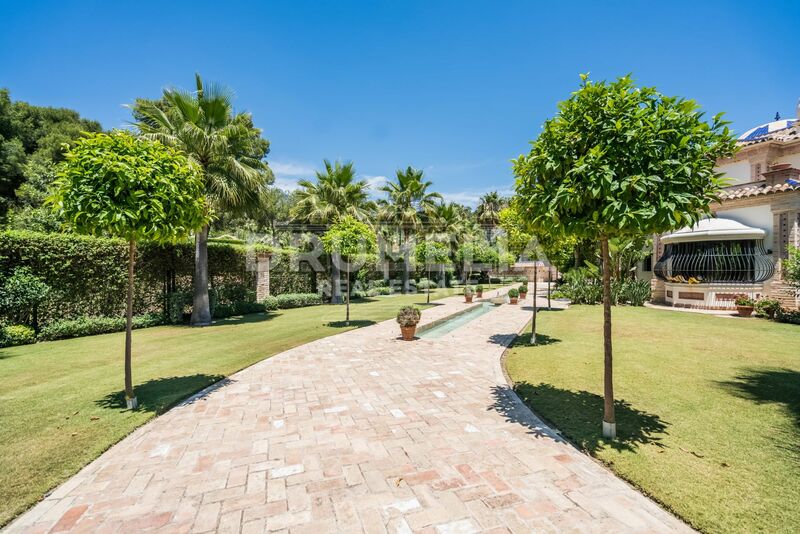 Generous plot of 3.695m2 enjoys privacy, tranquillity and exquisite landscaping. 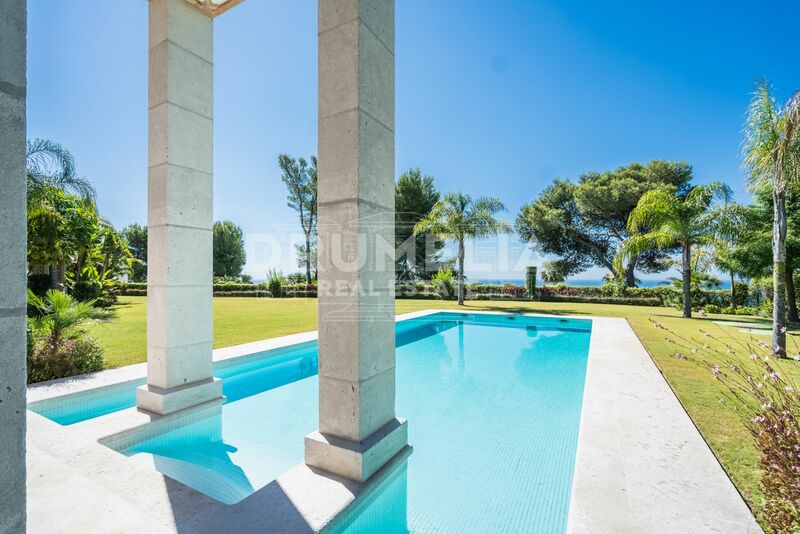 Remarkable outdoor spaces have been carefully created taking full advantage of the jaw-dropping views to the sea, mountains and emblematic La Concha, with delightful seating areas, a handcrafted gazebo with marble arches and columns and a heated pool of 20m. 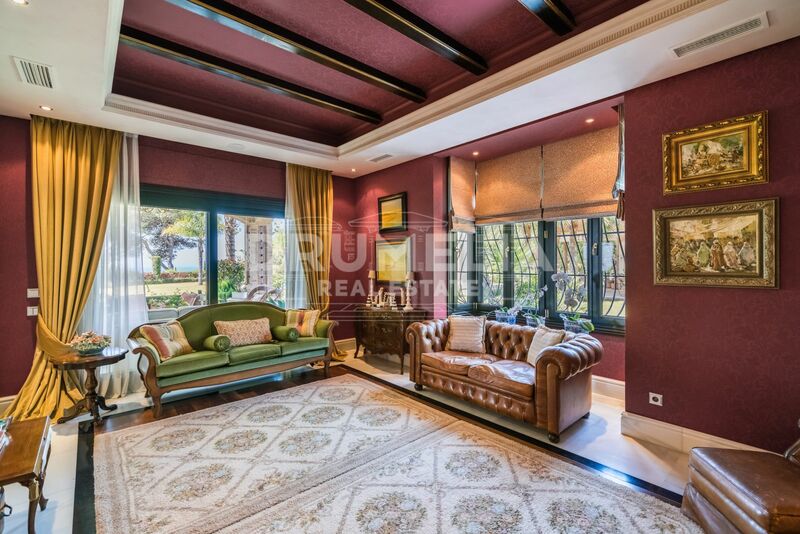 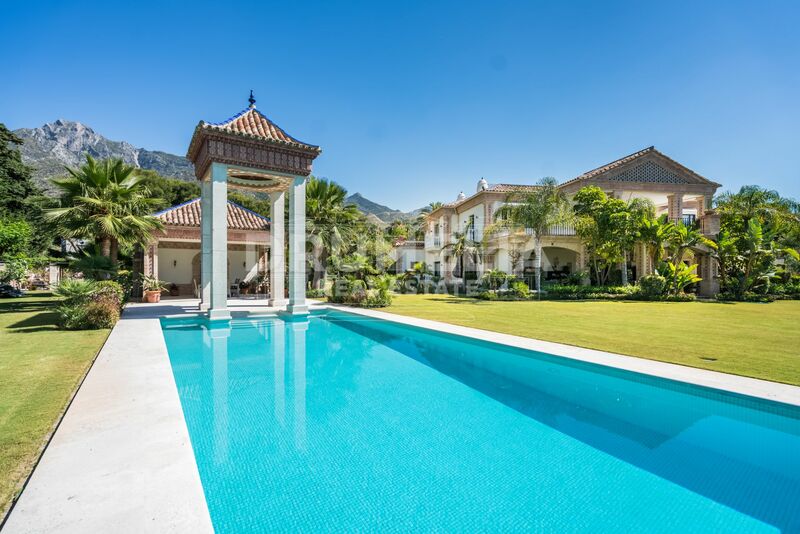 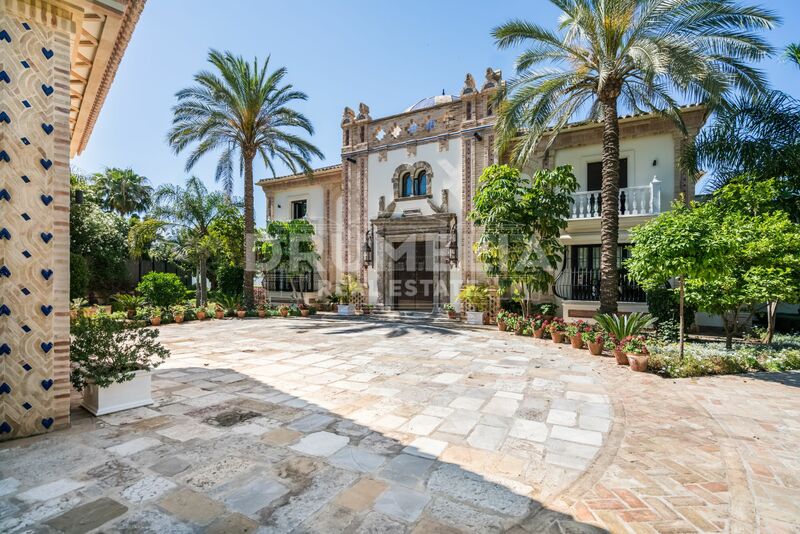 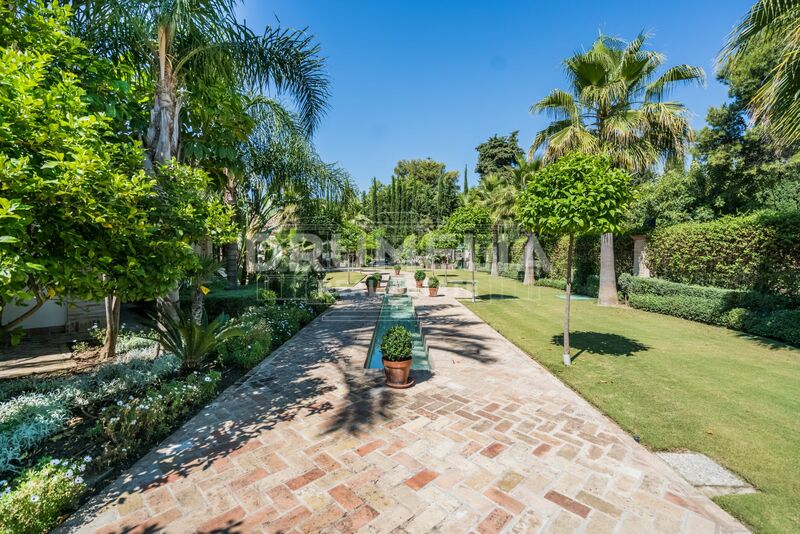 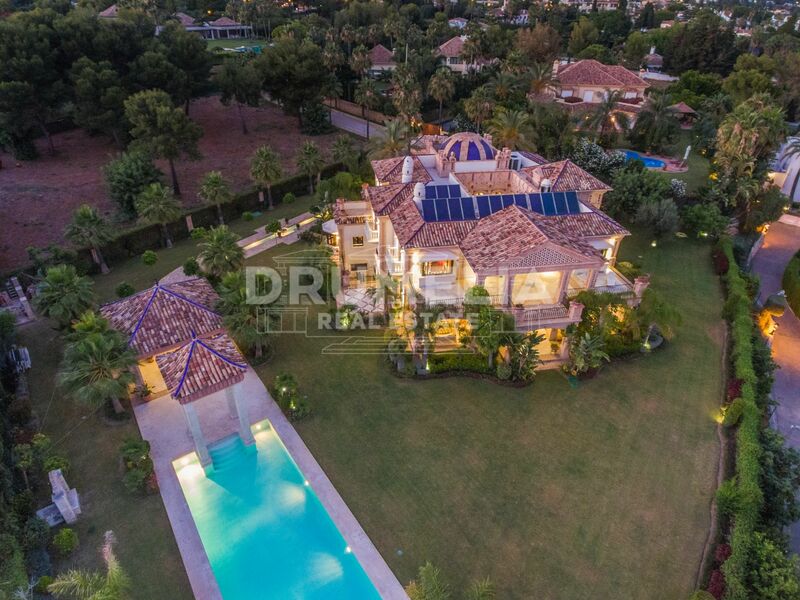 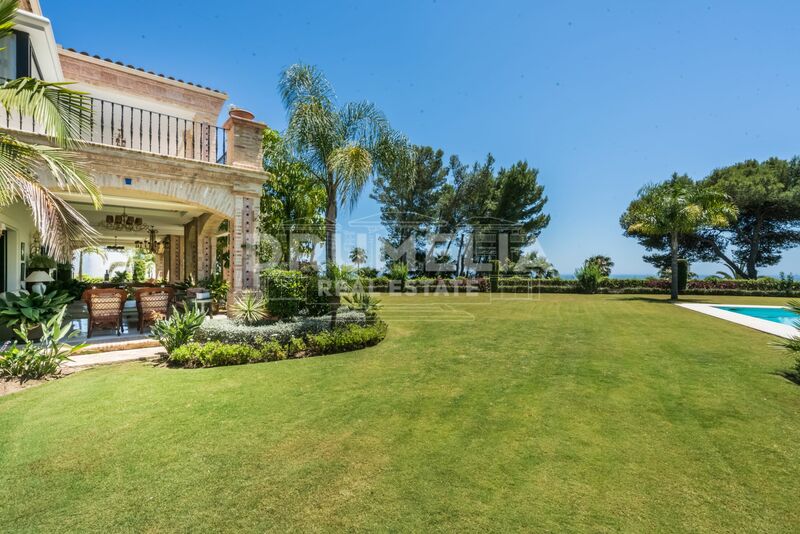 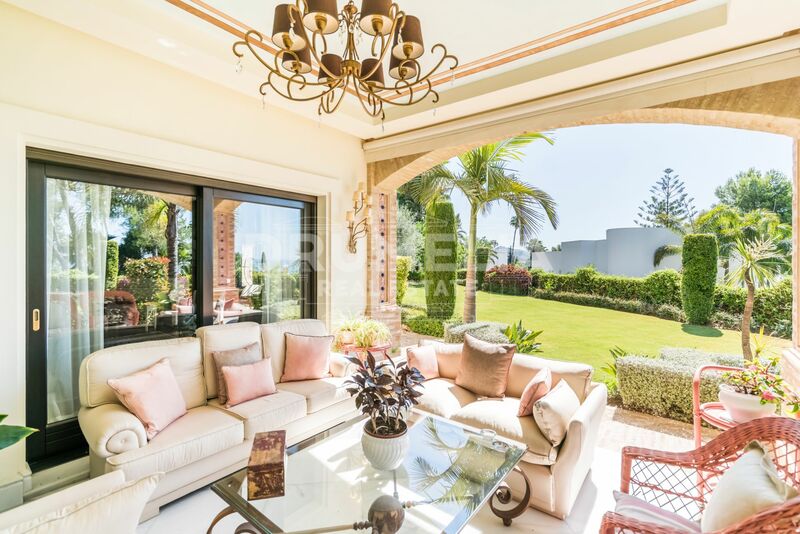 Whilst the property’s setting in the luxurious gated community known as “Spanish Beverly Hills” is peaceful, it is also highly accessible, with good proximity to all amenities, beaches and glamorous Puerto Banus. 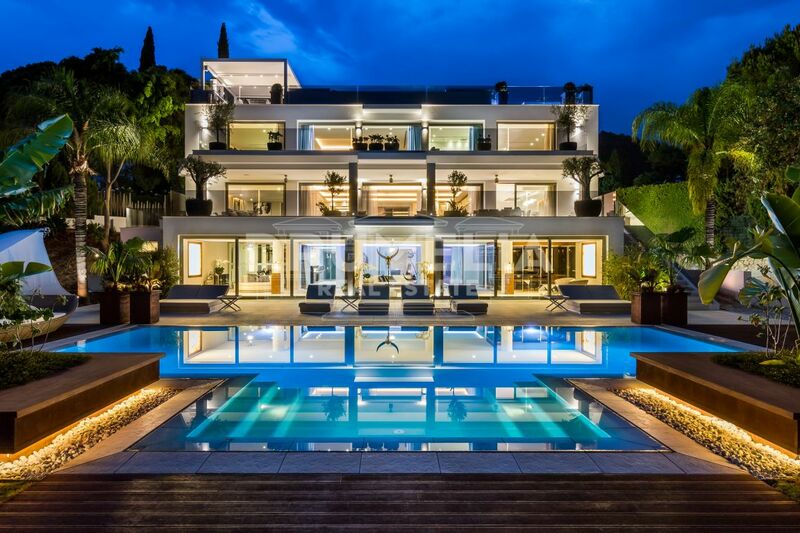 You deserve the most exclusive lifestyle and will have it guaranteed!